This week’s post features the return of regular contributor Isabel Hernandez who has been looking into the history of one of Kensington’s most iconic buildings. When you live in a place and go about your busy routine, especially in large cities, your perception of what surrounds you can sometimes become clouded. This is true of buildings. When we are not consciously looking for them, their presence often goes unnoticed. Some buildings are not particularly attractive or significant; most are functional structures. The over-familiar landmarks can become so much a part of our everyday existence that we rarely imagine them never being there, and so we don’t give them much attention. 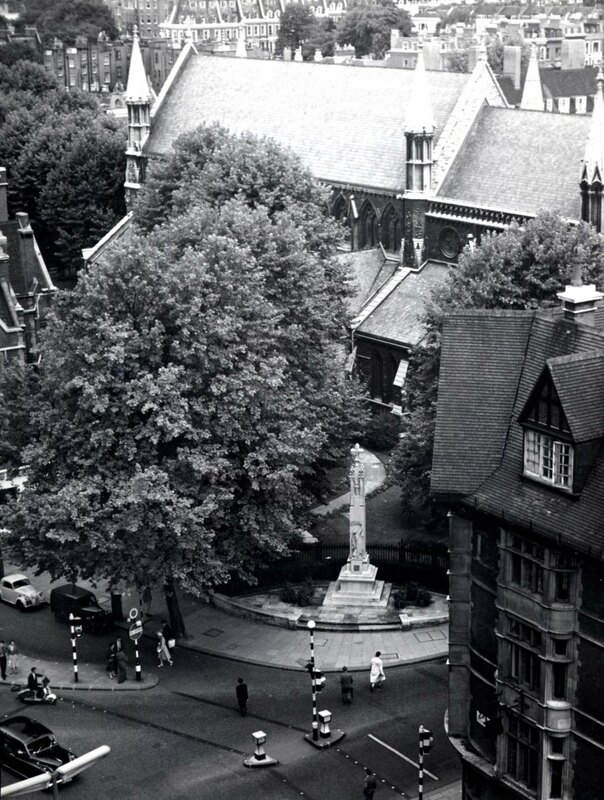 Tucked away at the junction of Kensington High Street and Kensington Church Street stands St Mary Abbots Church. You may have passed it many times; perhaps even fleetingly noticed its quiet presence away from the hubbub of traffic and rushing people, before continuing on your journey to somewhere. You may be a resident and have attended services, recitals, or special occasions celebrated within its walls, you may even have been a passing pilgrim in search of a little quiet meditation away from the madding crowds. 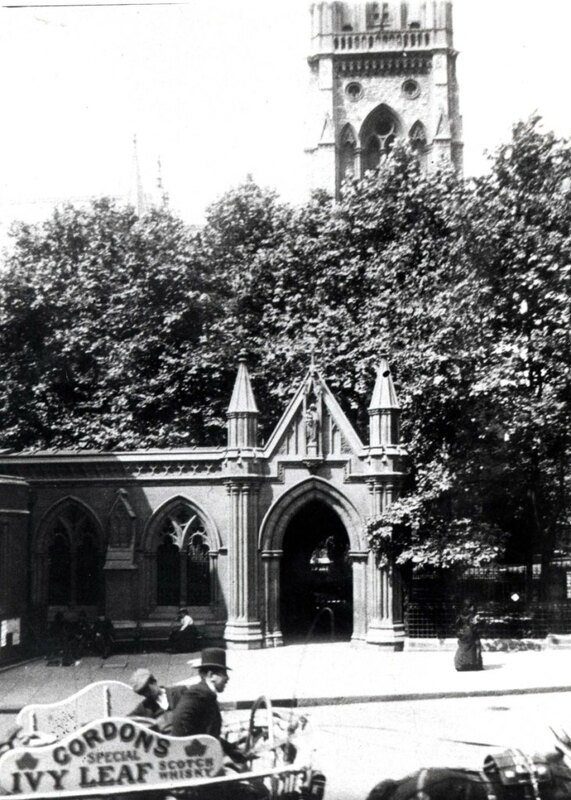 Whatever your encounter with St Mary Abbots, it has been a presence in Kensington for centuries. 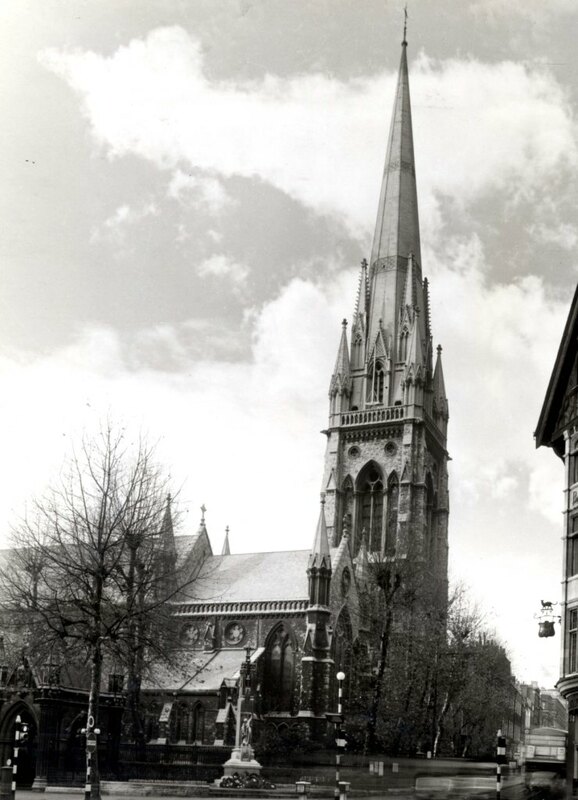 Below is a photograph taken around 1950 of St Mary Abbots with its stunning tower and spire. Kensington is mentioned in the Domesday Book as Chenesiton, the manor belonging to Aubrey De Vere. There is uncertainty as to whether or not a church existed in the area in Saxon days but we do know that a gift of land was given to the Monastery of Abingdon by Godfrey De Vere with consent from his family as a testimonial of gratitude towards the Abbot responsible for “having cured him of a former sickness” (Thomas Faulkner, in his History and Antiquities of Kensington, 1820). It is at this point that a Vicarage was ordained and endowed, with patronage eventually given by the Bishop of London. The medieval church was largely rebuilt between 1683 and 1704. It is not known if it was built on the site of the original church which was granted by the Abbey of Abingdon c.1100. What we do know is that St Mary Abbots has undergone a series of incarnations with rebuilding and repairs throughout its existence, eventually culminating in the church building we know today. According to a survey done in 1866, when it was clear that the old church was falling apart, “it was found that many of the walls consisted of a thin skin of brickwork encasing a rubble core, indicating that in some cases the medieval walls may merely have been refaced with brick”. The beams were riddled with dry rot and it was clear that the church was no longer fit for purpose. With a growing population, the demand for a suitable parish church meant that something drastic had to be done. 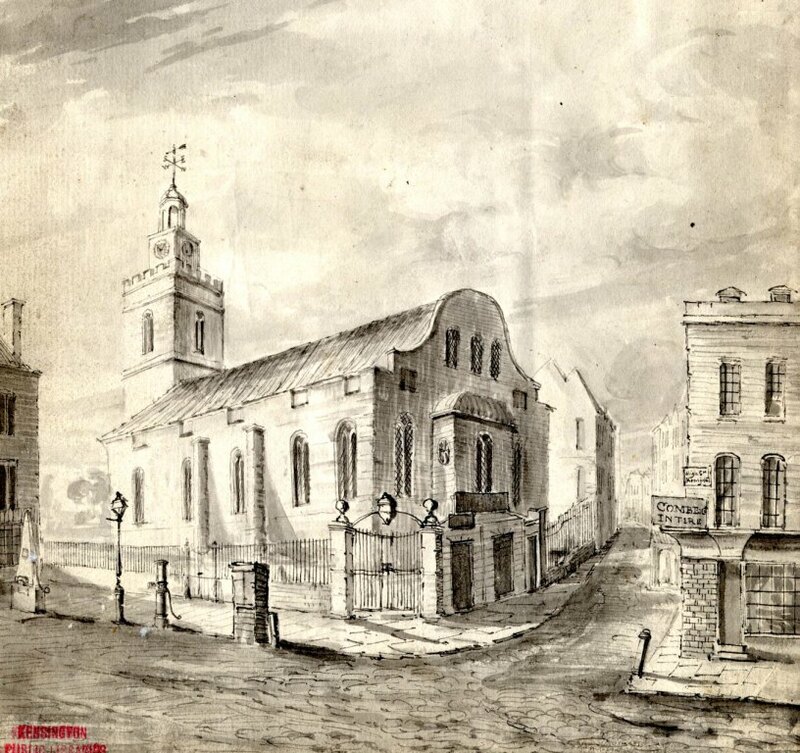 Here is another (unknown) artist’s creative depiction of about 1840. Occasionally, when you compare an etching or a drawing to an actual photograph, you can sometimes appreciate the accuracy with which a decent artist could recreate an image before the age of photography became the new emperor, even if some details were subject to poetic licence at times, such as the width of Kensington Church Street here. Also, you may find features that may have been illustrated earlier by another artist in the exact same place – the water pump on the left, for example. You will also see it in the image above this one by Woodburn. There appear to be a few young chaps milling around in the foreground with a horse taking a break from its carriage duties eating out of a nose bag. To the right, along Church Street, there are evidently shops and a few blurred shoppers going about their business. One thing I enjoy about these old photos is trying to ascertain what I’m looking at when I focus on an area and increase the magnitude. To the right of the church you can see a butcher’s shop with a long line of whole pigs hanging from a shop window. Quite extraordinary! Of course, these were the pre-packaging days when organic was the order of the day. 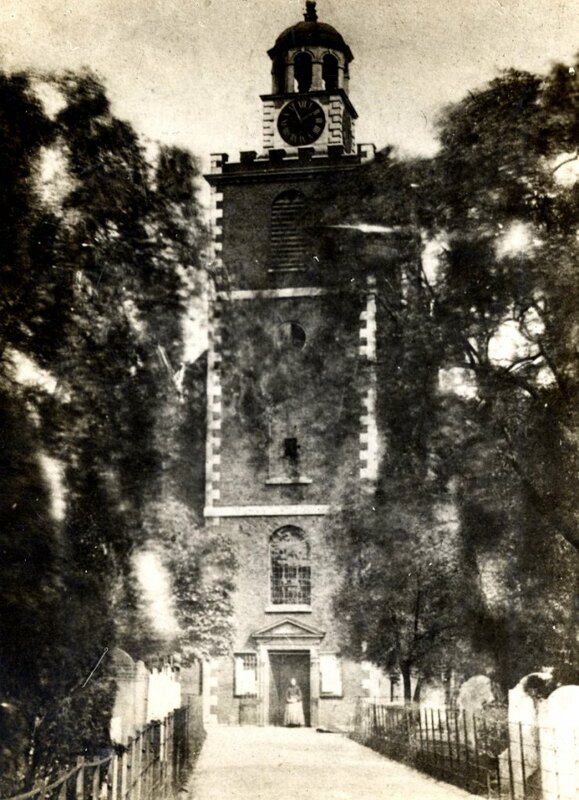 This is one of my favourite photographs of the old St Mary Abbots Church. The image of the solitary figure standing in the doorway makes for a compelling ghost story. But I would think that the lady may perhaps have been in the employ of the church as caretaker in one form or another. Not a ghost at all, even if memory of her is most likely forgotten now. 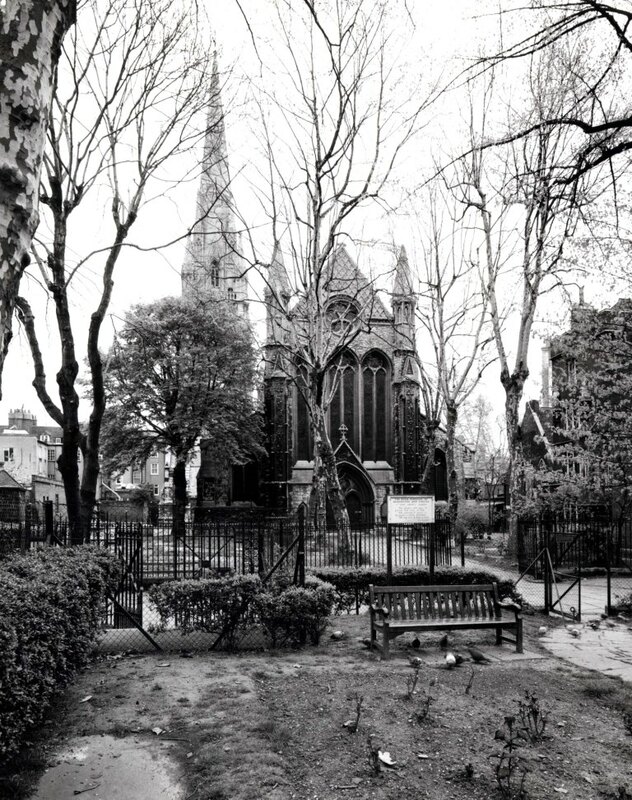 This photograph was apparently taken around 1865 in the church grounds showing the tower and part of the burial ground one year before the 1866 survey was conducted to ascertain the condition of the building, which was declared unsafe: the vaults and the foundations needed particular attention and were considered an embarrassment. 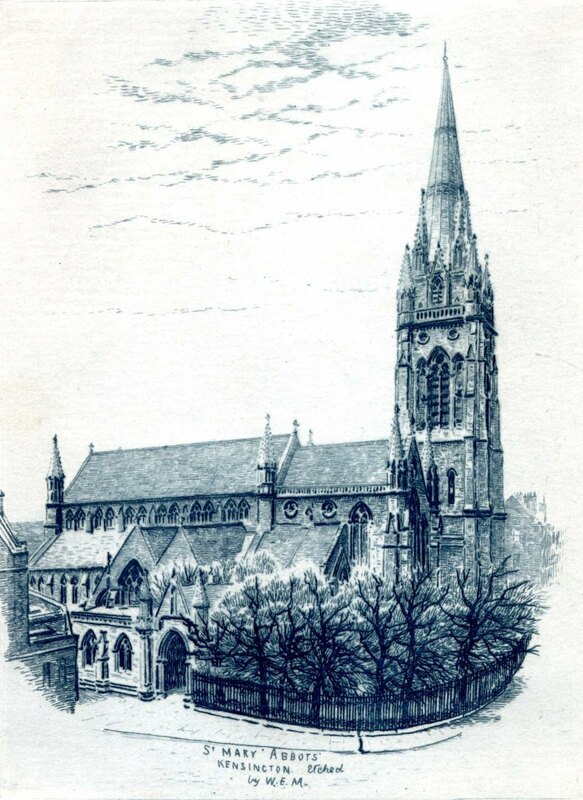 (The Story of St Mary Abbots Kensington – J. D. Guillam Scott). 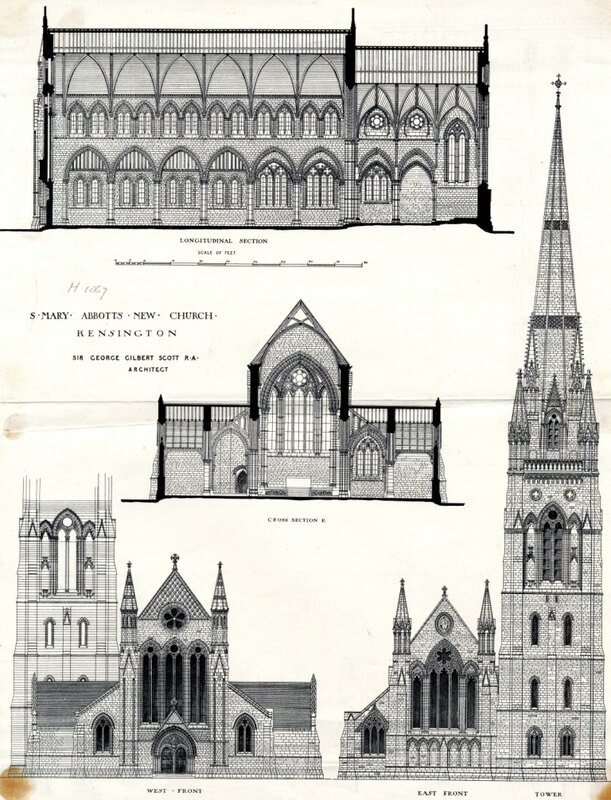 The man who was commissioned with the job of creating Kensington’s new church was the leading architect, George Gilbert Scott who was working on the Albert Memorial at the time. 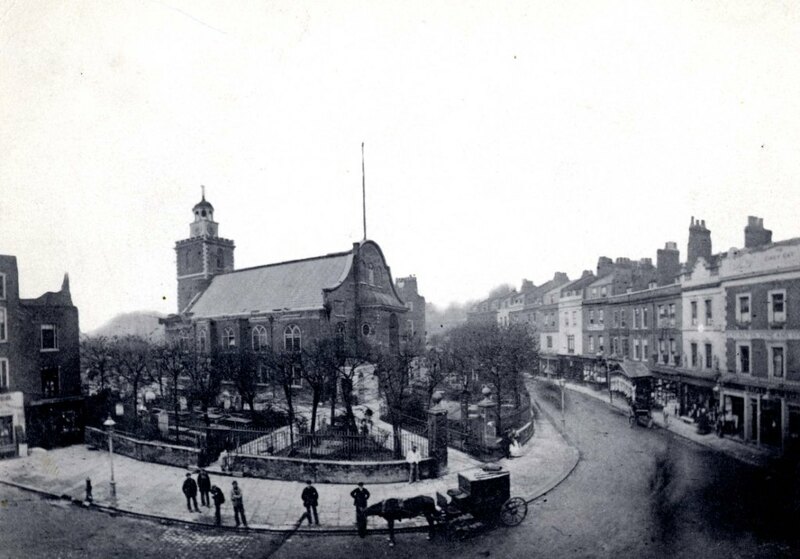 Here is another view of the old church at ground level (1869) from High Street Kensington. Demolition of the old church appears to be underway. Behind the closed gates you can see the remnants of what look like timbers or beams. 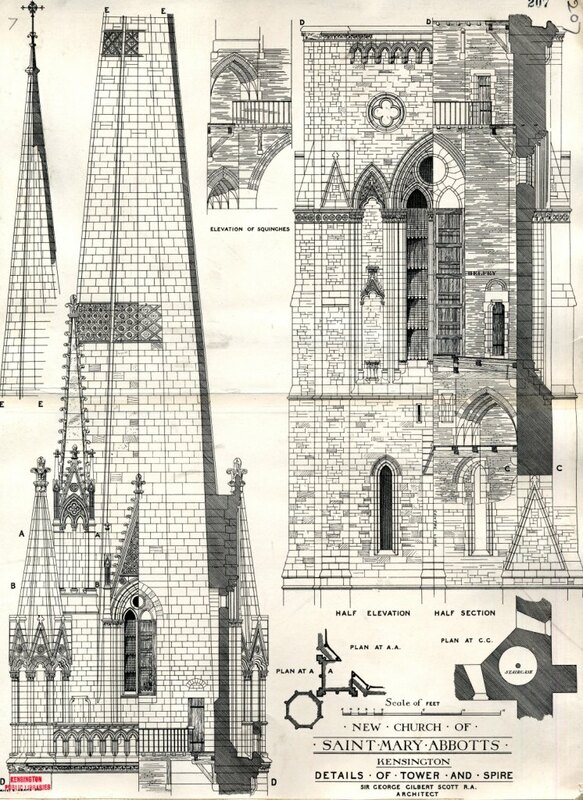 Sir George Gilbert Scott is probably best known for his Gothic Universal style. His practice was never short of commissions, especially ecclesiastical contracts. They were not considered the most prominent examples of his work, but the scale of his achievements is quite astonishing, to the point where it could be said he was something of a workaholic. When he was approached, after a unanimous decision was taken to rebuild the church from scratch, the project was considered to be in safe hands, even when his original plan was met with both criticism and praise. He drew up a plan with an estimated cost of £35,000 – quite staggering for the time – but after some modification, and funds allowing, the first contract was approved, work beginning with the chancel, the vestry, and the foundations of what would become the present day St Mary Abbots. It was around this time that Scott’s health began to fail him. He became very ill in November 1870 with heart disease and bronchitis and he relied on his son, John Oldrid, to deal with much of the firm’s commissions. The Scott family of architects have all had a hand in work for Kensington. The son, John Oldrid Scott, and grandson, Sir Giles Gilbert Scott, both had designs incorporated into St Mary Abbots, and were well known architects in their own right. Sir Giles Gilbert Scott (grandson) is also responsible for the Carmelite Church which is also in Kensington Church Street. It replaced the original building designed by E.W Pugin in 1865-1866, bombed during the war. He is also responsible for Battersea Power Station and the iconic, red telephone box, amongst many other works. 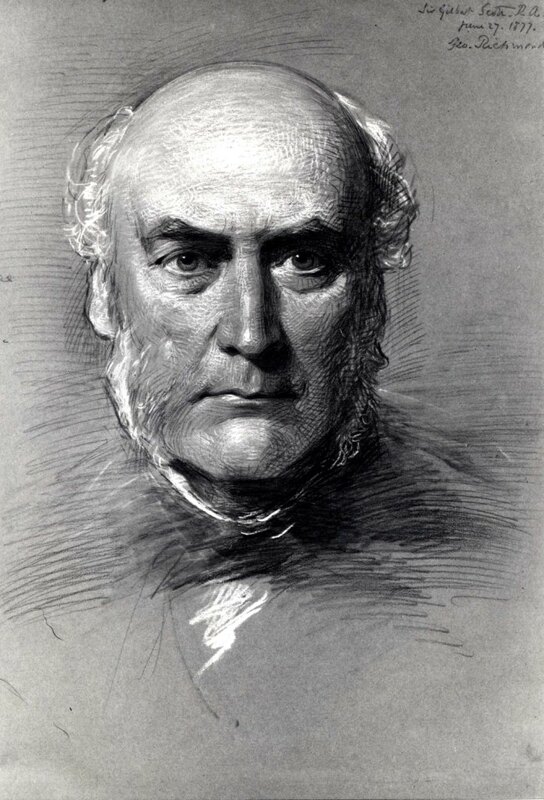 Sir George Gilbert Scott died of heart failure on 27th March 1878 at Courtfield House, Kensington. He was buried in Westminster Abbey with Queen Victoria joining the funeral procession from Kensington on the 6th April. The demand for Gothic-style buildings in the Victorian era led to many churches in South-east England being built of Kentish ragstone, amongst other materials. It is basically hard, grey limestone that was laid down in the cretaceous period and is hard-wearing. Ideal for large structures. Bensted’s Quarry, also known as the Iguanodon Quarry, around Maidstone, is famous for the fossilised remains of an Iguanodon found when limestone was being excavated in 1834. It is from this quarry that the ragstone used to face the church originated (contractor’s report 1881). The quarry was apparently closed in 1872, the same year St Mary Abbots was consecrated. 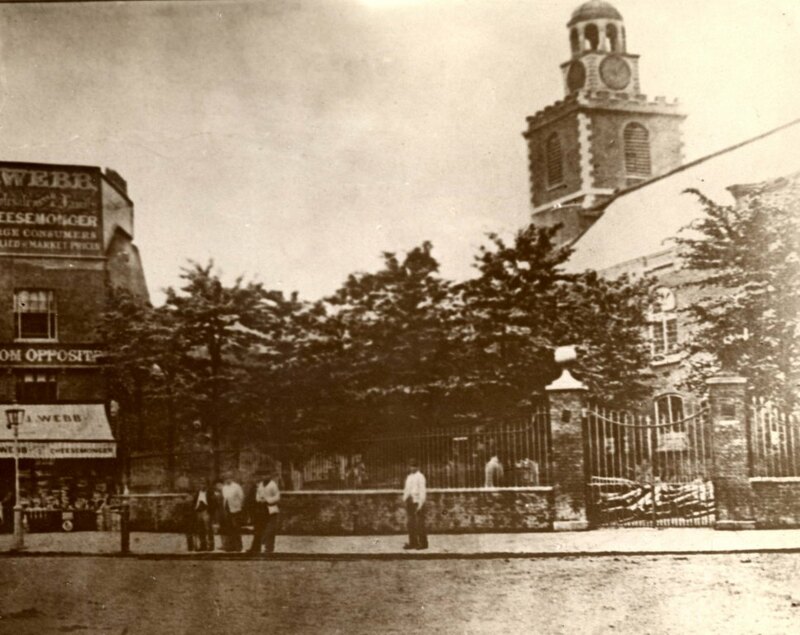 A rare image of St Mary Abbots in 1872 before its tower and spire were built. It would be another seven years before it was completed. 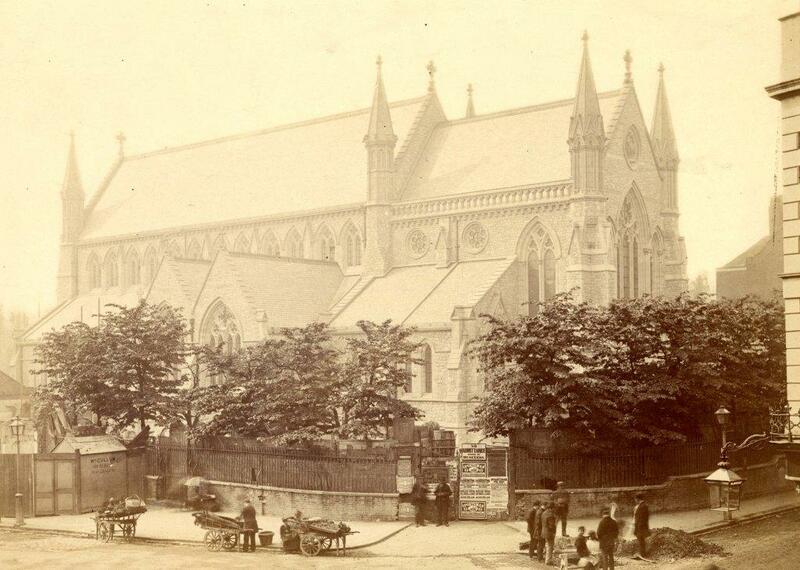 Demolition of the old church took place in 1869 after parishioners approved a slightly amended design for its replacement. 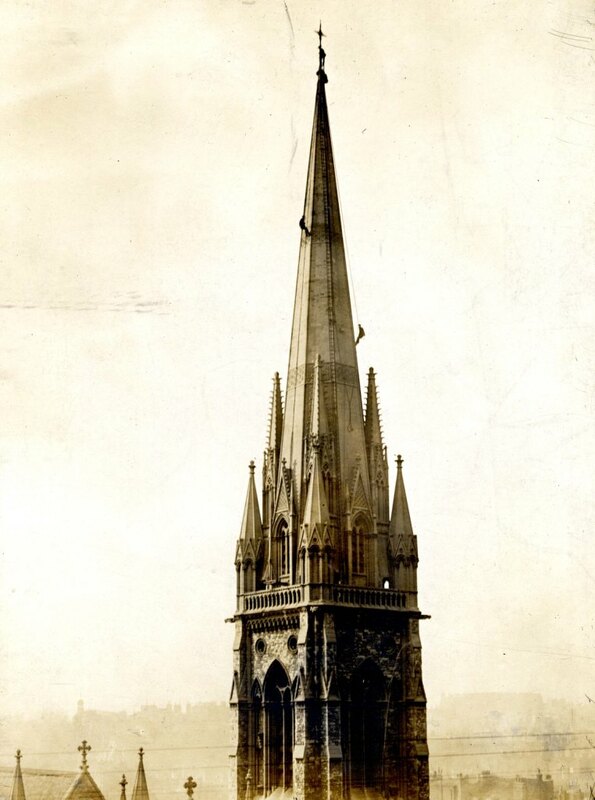 The main body of the new church was quickly built over the course of three years or so, and considered sufficiently far advanced to be consecrated on 14 May 1872, later completed when the top stone of the impressive spire was laid in an elaborate ceremony by the Rev Edward Carr Glynn on the 15 November 1879 after a special service was held on what was a windy day. Unlike their Georgian predecessors, the Victorians tended to be bolder in their architectural statements, and churches were no exception. Before the 13th century, towers were rare on parish churches. By the 13th and 14th centuries they were usually only seen in major towns, or built at the behest of a very wealthy benefactor. Towers and spires serve no real liturgical purpose other than to house the bells. Whatever the accuracy, the vertigo I feel looking at those chaps on the spire is enough to make me understand that yes, the height of the tower and spire is formidable and impressive. The three gentlemen appear to be inspecting the structure at different points. I wonder at the near impossibility of such a feat, but what a view! 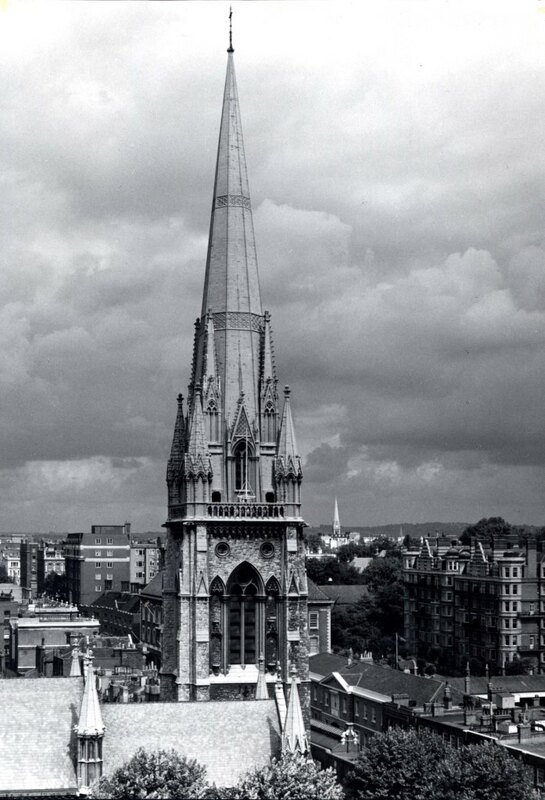 This photograph (1960) was possibly taken from the Barker’s building opposite and shows in great detail the tower and spire, apparently inspired by St Mary Redcliffe, Bristol. From here the peal of ten bells can sometimes be heard harmoniously ringing across Kensington to remind us of St Mary Abbots’ presence. In the distance, to the right of the tower, you can also see the spire of St Matthew’s church in Bayswater, built in 1881-82. It is of a similar height to St Mary Abbots, measuring around 240 feet. Church building was big business for architectural firms of the period. A growing Victorian population kept the building firms and parish districts busy; the smaller chapels and crumbling older churches could no longer serve the parishioners. The Paddington district, particularly, had one of the highest population densities in London. Most green spaces in West London soon succumbed to the building boom to accommodate this growth. This is the ‘winding and rising vaulted cloistral approach’ to the south door of St Mary Abbots added by John Oldrid Scott in 1889-93. The arched entrance almost looks forbidding – something about gothic tales and fanciful whims to fuel the overactive imagination – but as soon as you walk through, those feelings vanish. The sense of another era and the peace and quiet away from the traffic soon becomes a welcome respite. Here is another view, of 1960, showing the steeply pitched roof of the church. Unfortunately it is not the original roof. That was destroyed during the bombing of London in WW2. The monument you see in the foreground is a war memorial dedicated to those of Kensington who died in the war. Below the great church are people going places. It does not look busy but I suspect this is a very early morning photographic shot, taken before the rush hour. It is also worth noting that some modifications to that junction have been made since then to accommodate the increasing traffic. London’s noise and bustle is consistent throughout the decades. But one could argue that this is a typical characteristic of any major city. The throes of autumn: conjure up a little mist and you could be on the set of a gothic drama. I have often had my lunch here in this quiet garden, away from the fury of traffic and the impatience of people. It looks lonely here. You can still find gravestones scattered around the church ground, mostly just eroded relics of a time and people that once were. But it is never lonely, more of a small sanctuary. And then there is St Mary Abbots, architecturally “a solid and impeccably detailed essay in the Early English style” and yet to me, something of a majestic presence bridging the old Chenesiton and the modern Kensington. The next time you go for a walk, take a look around. You may find yourself in the presence of a lovely building that you may not have noticed before. Consider it a moment of awareness when the cloak of invisibility suddenly peels away to reveal something interesting. In this post I have concentrated on the exterior of St Mary Abbots. Many of our historical publications go into great detail regarding the church but I wanted to try and keep to one aspect of the church as indeed there is scope for so much more within our collection: the church interior is equally as fascinating and potentially there are more posts to come. Most of the quotes I have used are from the Survey of London. I have also consulted Pevsner, and other sources which I have credited above. Not being an architect myself these were invaluable and I would urge anyone who is interested to consult these for further information. A special thank you goes to Jane MacAllan (SMA archivist) and Pat Wilson (SMA Parish Clerk) who were kind enough to show me around St Mary Abbots over the summer and are a wealth of knowledge. I hope to put that to good use in another future post about the church. And thanks to Dave for being infinitely patient with me on this one. Isabel has no need to thank me for my patience. I know she looked at practically every picture of SMA we have. (And we have a lot).It was worth the wait. Next week is Halloween of course. This entry was posted on Thursday, October 22nd, 2015 at 12:12 am	and tagged with George Gilbert Scott, Kensington Church Street, Kensington High Street, St Mary Abbots Church and posted in 18th Century, 19th Century, 20th Century, Kensington. You can follow any responses to this entry through the RSS 2.0 feed. It’s been 60 years since I passed this church daily. Thank you so much for posting this interesting piece of history. I lived with my parents and 5 brothers (the youngest born in London) in a house we rented at 24 Holland Street. (My father was a U.S. army officer) I have been back to visit the outside of the house and especially Church Street many times, but would so love to know more of the history of shops, etc. there at that time. A wonderful young woman owned the Turret Shoppe (puppets were a specialty). her name was Natalie Dalbon, and she let some of us young ones ring in a sale or two. There was lovely sweet shop, where we could purchase a piece of candy for a farthing, four pieces for a penny. The best licorice and lemon sherberts. I used to pal around with Francesca Annis whom I have since followed with great admiration. Thank you again for posting. I am currently working on a project with my course in interior design concerning a housing and commercial development on Kensington Church Street. I am focussing on the history of the street and its inhabitants. I would be delight to have a chat with you about your history with this street and how you’ve seen it evolve in 60 years. Let me know if you could be interested to help me with my project. I would love to chat with you, but I’m not sure I can contribute much more than my original post denotes. At the Holland Street end (top), there was an apartment complex on the left. My friend Caroline Owens lived there. It is (or was in 2006) a high-rise business building now. And at the southern end on Kensington High Street (right-hand side/corner of Church Street) there was a wonderful library, which is now a bank. I spent many happy hours in that library. The delay in my response was due to waiting for my brother Neil (five years my senior) to add what he remembers. He last visited London in 2000! He only remembers a tobacco store, where you could also buy the newspaper! I wonder if you could somehow contact Francesca Annis, whose family lived there back then. I believe she still lives in W8, not far from where she grew up! 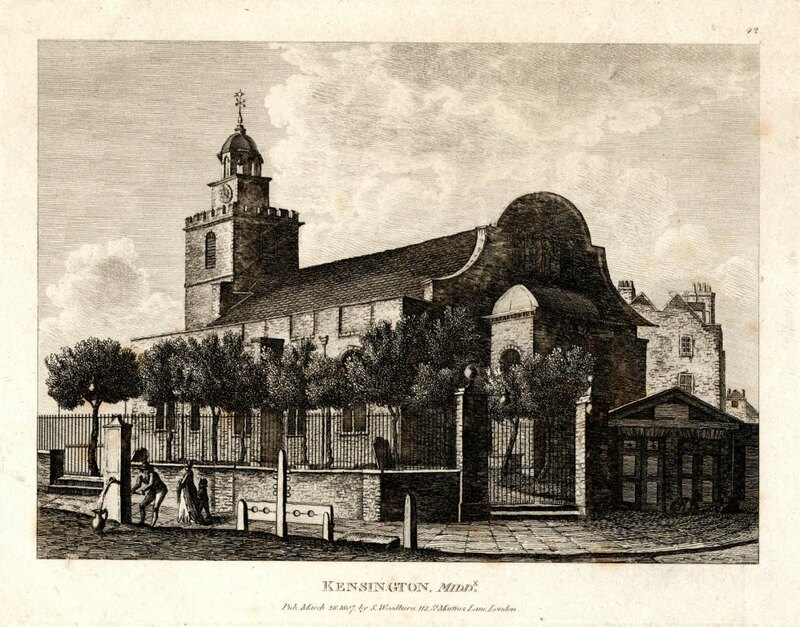 In my work in progress, “Jem, a Fugitive from London,” a wedding takes place at this church on September 30, 1761, so thank you for the pictures in this post (and the history as well), which have allowed me to accurately convey the wedding venue.